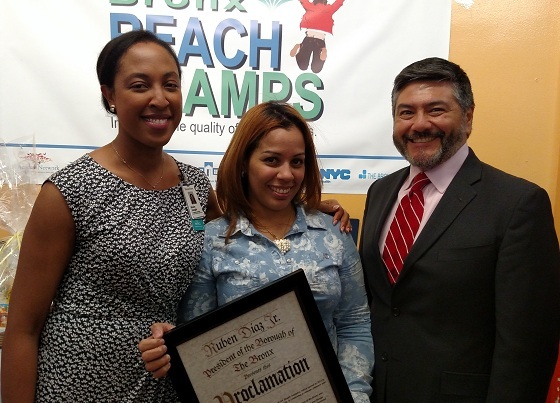 Montefiore's Nicole Joseph, Gold Grill Deli Grocery owner Patricia Tejada, and BCHN's Mike Hernandez. The Bronx Community Health Network (BCHN) led Bronx REACH CHAMPS Program and the Montefiore Office of Community & Population Health co-sponsored a grocery store recognition ceremony on Tuesday, May 10 at Eastchester Gardens. Two local stores--Gold Grill Deli Grocery and Vivian Grocery--received proclamations from the Bronx Borough President's Office after completing required steps in the Montefiore Healthy Store Initiative, a collaboration with Bronx REACH CHAMPS and the NYC Department of Health's Shop Healthy NYC Program. Montefiore's Community & Population Health Program Supervisor, Nicole Joseph, led off the program, and was followed by remarks from Mike Hernandez, BCHN's Bronx REACH CHAMPS Program Manager, and Craig Willingham, Program Development Manager, New York City Department of Health and Mental Hygiene, Center for Health Equity. "Every small change that bodega owners make in their stores can have a lasting impact on the health outcomes of our Bronx communities," Joseph explained. The two honorees are working "to provide healthy options in their stores for community members coping with conditions such as diabetes, hypertension and obesity." The goal of Bronx REACH CHAMPS initiatives is to reduce obesity and improve the overall health and wellness of the Bronx's culturally and ethnically diverse population. "We are trying to affect positive health outcomes for the people in the Bronx that need help the most," Hernandez explained. Willingham expressed his appreciation for the efforts made by the store owners to bring healthier products to their neighborhood. "It's really exciting to see this day finally come to fruition," he told the audience, which included community members from places such as Eastchester Presbyterian Church. Patricia Tejada, the owner of Gold Grill Deli Grocery, was on hand to receive the Borough President's proclamation. "I'm so excited I can help people get healthy food," she said.